While you may already know that you can sail around Cape Cod aboard The Liberté, did you know that you will also see the many charming historic landmarks of this coastal town? While you may already know that you can sail around Cape Cod aboard The Liberté, did you know that you will also see the many charming historic landmarks of this coastal town? With so many historic properties and lighthouses to see along the coast of Cape Cod, what better way to see them all than from The Liberté? As you embark on your next adventure aboard The Liberté this summer, be sure to have your camera ready for these three historic landmarks of Cape Cod. Built in 1876, the Nobska Light is a lighthouse located in Woods Hole, Massetchutes. Sitting at the southwestern end of Cape Cod, the Nobska light offers a picturesque view of a classic Nantucket lighthouse on the water, with views spanning to Martha’s Vineyard. What better way to see a classic landscape of Cape Cod? As you sail along the harbor on The Liberté, you will have plenty of opportunities to take pictures and enjoy the view of this charming, historic site. On the outer lining of Buzzards Bay, the Elizabeth islands sit as a string of tiny islands along the southwest coast of Cape Cod. Named after Elizabeth I, the islands were established in the mid-1600s by early English settlers. As the smallest town in Massachusetts, the Elizabeth Islands are not only a beautiful sight to see from the water, but also a glimpse into early colonial history. If your sail aboard The Liberté takes you south of Cape Cod, you may also catch the scenic views of Waquoit Bay, a national estuary along the southern shore. With beautiful views of the blue water and sand along the coast, your view from The Liberté will be nothing short of a postcard from Massetchutes. Ready to See Cape Cod for Yourself? Spring is the perfect time to schedule your day of fun aboard The Liberté this year! 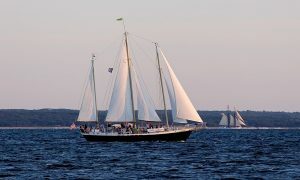 If you are ready to see the beautiful landmarks of Cape Cod for yourself, why not book your daysail today? As a family-friendly schooner, The Liberté is perfect for spending a day on the water with your family, including kids of all ages. Book your special day on the water today! Plan Your Day Aboard The Liberté this Year! This entry was posted on Thursday, April 4th, 2019 at 2:39 pm. Both comments and pings are currently closed.